Robotcaliser is the term that the Robotics group of SYMOP selected to promote robotic automation as a decisive alternative to relocating. 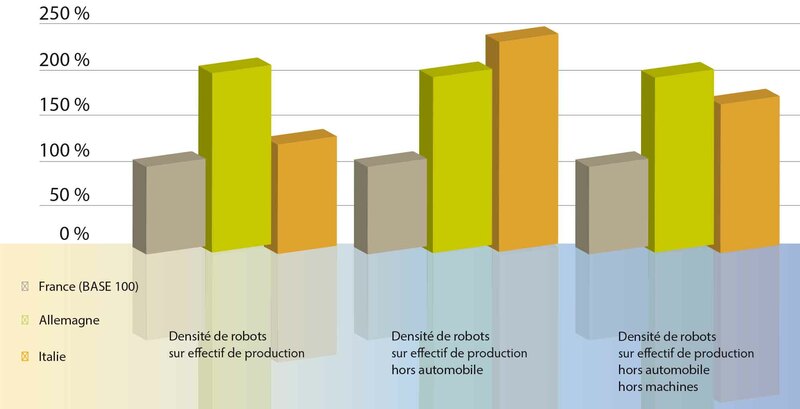 By offering increased productivity and additional quality guarantees, the robots and robotised systems enable French small and medium enterprises and industries to improve their performance, increase their adaptability and flexibility and remain competitive. They help you to “robotcalise”: find the robotics experts, members of SYMOP here. In France, the population of industrial robots is 124 robots for 10,000 employees, whereas it is 273 in Germany and 160 in Italy. The numbers are similar for the automobile sector in all three countries however it is twice less in the other sectors of the French industry. This gap must be bridged to allow small and medium industries to increase their competitiveness. They support the Robotcaliser action! Robotcaliser success stories, what about you?